Word reading games are not something I find particularly easy to design, so I’m really proud of this one. I seem to have more ideas for writing and maths games, but I think this reading game is quite effective. We have been reading the 3 Little Pigs as a focus for learning, and I thought this would make a good context for a reading game. Learners take a slip of paper and read the words. They then colour the pig the correct colour and write their name. The colour words are displayed in the reading area to support children. We completed this activity last week as a teacher led lesson. I spoke about how to look at the letters, say the sounds and then listen to the word. We discussed how it’s okay to listen to the sounds in the word a few times, rather than trying to guess the word. After this lesson, I set up the reading area so children could revisit what they have learned. 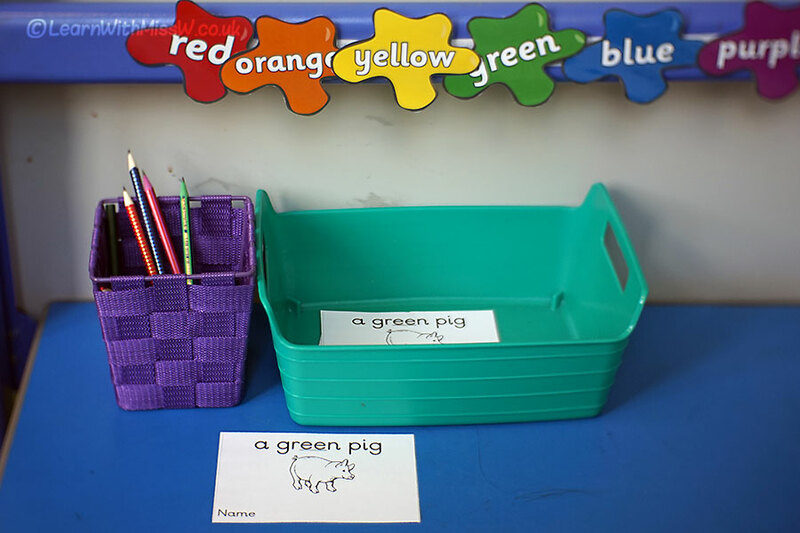 The children have been taught all the single letter sounds and a few digraphs, which greatly limits the range of words they can be expected to sound out easily, hence the green pig! I have underlined the digraphs in the words to help children identify them and read the word correctly. Ideally I would have liked all the words to be phonetically regular, but that was not possible for this activity. I hope that the coloured vocabulary cards will help make this a manageable activity.